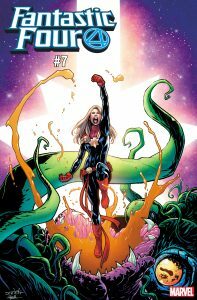 Captain Marvel Blasts onto Comic Covers This February! Captain Marvel is heading to the Marvel Cinematic Universe, and Marvel is celebrating the legacy of Carol Danvers with special variant covers from superstar artists Mike Hawthrone, Gerald Parel, Pepe Larraz, Valerio Schiti and Jesus Saiz! Don’t miss your chance to collect all five variant covers, coming to comic shops this February!